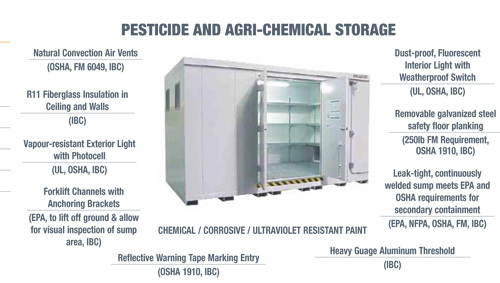 HERBERT WILLIAMS offers a complete line of buildings for storing agri-chemicals safely All buildings are designed to help keep you in accordance with safety rules when mixing and handling pesticides. HERBERT WILLIAMS products will help to protect you from chemical spills, children and animal poisoning, theft, fire and unauthorized personnel Meets or exceeds EPA regulations. 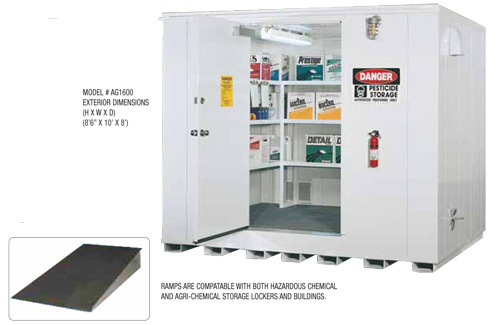 Agri-Chemical Lockers/Buildings are also available with 2 and 4-hour fire ratings. Fire- rating is dependant on the proximity of the location of your outdoor storage Locker/Building to any adjacent building or property line. Storage Units located within 10 feet of a main building or property line require a 4-hour fire rating. Units located more than 10 feet and less than 50 feet from a main building or property line require a 2-hour fire rating. Units located more than 75 feet from a main building or property linerequire do not require a fire rating (Check with your local authority having jurisdiction).